Today before rest time, we took some time to play with Wikki Stix and to play with names–the names of people in our family. It was a rainy, gray spring day, and we were beat after a morning of soccer practice. So we took it easy, using the Wikki Stix to form letters, make balloons, and twist them into a huge nest. I brought out the white boards so that we could do some writing, but Cora was too wrapped up in Wikki Stix to even be a little interested in white boards and Expo’s. Letter Connect: I watched Owen’s super-skilled preschool teacher do this a while back, and I marveled at how easy it was but how neatly it got the students thinking about their names, their classmates’ names and the similarities among them. To play Letter Connect, you simply make connections between the letters in two names at a time, drawing lines to connect the matching letters. When there isn’t a match, you make a big ‘x’ alongside the names. Owen connects letters in our family members’ names. Because we had our Family List sitting nearby, we started with the names of our immediate family. 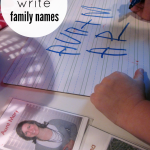 I said, Owen, let’s play the game you play in preschool–let’s connect the letters of the names of our family. We’ll start with ‘Owen’ and ‘Cora’. You draw the lines and tell me which letters are the same in your name and Cora’s name. So he drew a line from the ‘o’ in ‘Owen’ to the ‘o’ in ‘Cora’ and said, The o’s are the same. I said, You’re right! The ‘o’ that makes the ‘oh’ sound in ‘Owen’ makes the same ‘oh’ sound in ‘Cora’. Cooooora. Oooooowen. Hmmmm. Use the Family Chart to tell me whose name I wrote next and connect the letters. I wrote ‘Mommy’. 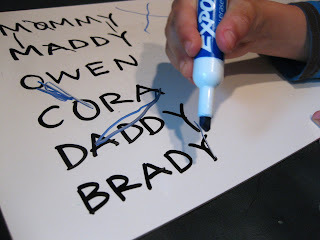 He looked back and forth at the Family Chart to make sure, then he said I wrote ‘Mommy’. Then he drew a line from the ‘o’ in ‘Cora’ to the ‘o’ in ‘Mommy’ and said, The ‘o’ is the same again! I added ‘Daddy’ to the list next, followed by ‘Maddy’, and Owen connected letters and we talked about the sounds as he went. When we finished with our family, we decided that I needed to make a new, updated Family Chart with Brady’s name and Golden and Guinea’s names. And he wanted to have another chart with the aunts and uncles’ names. I told him it was a great idea, that he was correct–we needed a new chart–but that it might have to wait until tomorrow. Rest time was a few minutes away, but we did have time to do grandparents and aunts and uncles. 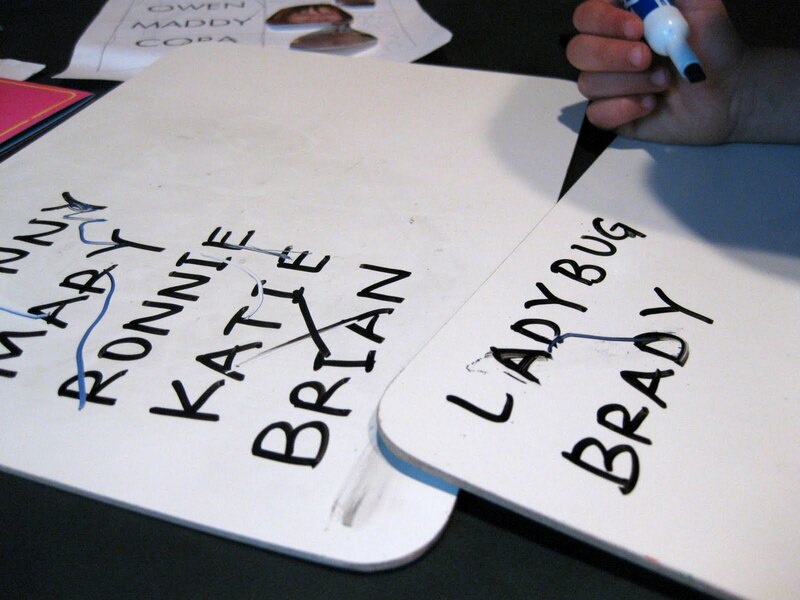 So we began with some extended family members until a ladybug found its way to our table–and our dry erase board–and Owen decided he wanted to do the ladybug’s name with Brady’s and then he wanted a home for the ladybug so it could come upstairs for rest time with him. So that was it for our Letter Connecting. I really love this game because it continues to reinforce the fact that names are a huge interest for emerging readers. And even though Owen wasn’t writing the names himself, he was working with me to investigate the letters and talk about the sounds the letters made. And he was reading as I wrote the names. Both-de Vries and Bus explain that “identification of the proper name is strongly related to phonological skills and letter-sound knowledge whereas being able to recognize words in the daily environment (e.g., Exit, MacDonalds, Coca-Cola) is unrelated to phonemic sensitivity or letter-sound knowledge” (quoting Blair and Savage, 2006, in The proper name as a starting point for basic reading skills). It makes sense: kiddos have an interest in knowing their name and the sounds within their name because it’s their name! They’re proud to ‘own’ their names, so parents should play it up! This is an easy activity that can be played just about anywhere, with no prep and minimal clean-up. But the learning dividends are high–so it’s worth some time! 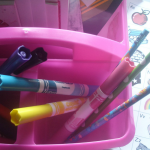 My 5-year-old has been fascinated with proper names – family names, friend names, pet names – since she started writing. This is such a great and simple idea for tapping into that. Pinning it now!